BESTHOBY LED tea light candle is Powered by CR-2032 Lithium-ion button cell, can stay lit over one hundred hours. It's great for weddings, restaurants and parties. 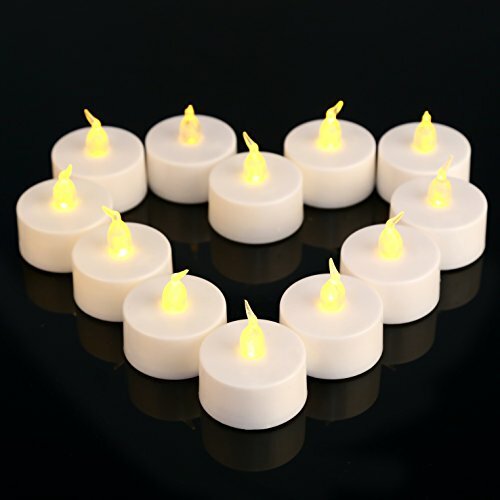 This flameless tea lights realistically generate flickering effect to simulate burning candles, no smoke or flame,It is clean&safty.When it is power off ,change a battery,it will lighting as a new one,so it is a long lasting tea lights candles. 1.Energy-efficient, and environment-friendly.This LED candle lights power by battery,no somke&flame,it's cleanning&safty for familyχldren. 2.Long-life.LED light powered by CR2032, estimated to last over 100 hours with one new battery. 3.Extensive use. LED tea light candles idea for holiday celebrations, wedding ceremonies, special occasions such as birthdays and anniversaries, memorial services, church gatherings, DIY projects;Wind-proof for both indoors and outdoors use, at homes, restaurants, churches, schools, backyards, sports venues and so on. 4.Reuse.There's a button at the tea lights bottom that makes it easy for users to change batteries and continue using as a new one. Batteries are generic and can be bought in any store. 5.【What you will get】-12 falmeless LED tea light in one pack . Good after sells servise. If you don't fall in love with your LED Candles when you open the packaging, we will refund. AND We offer a 12 month warranty. If you have any questions about this product by besthoby, contact us by completing and submitting the form below. If you are looking for a specif part number, please include it with your message.